Prepare a charcoal or gas-fired grill. If using a charcoal grill, group hot coals on one side of the grill base. Chop dill. Remove woody end of asparagus by cutting off last inch of the stalk or snapping at the base. Season salmon generously on both sides with salt and fresh ground black pepper. Place asparagus onto a baking sheet and season with salt and pepper. Drizzle asparagus with olive oil and juice from half the lemon, and turn with tongs to coat evenly. 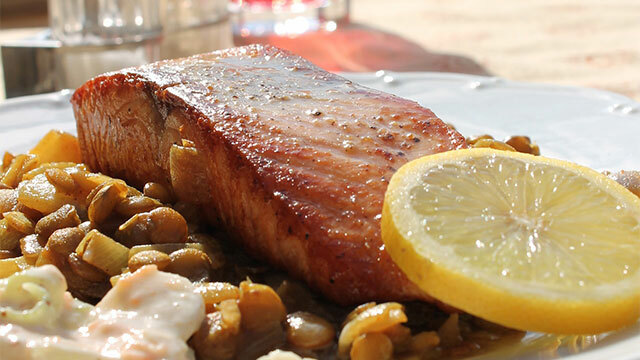 Place salmon directly over hot coals or on lowest shelf of charcoal grill for 2 minutes to sear, then move to a higher shelf (gas grill) or across from the coals (charcoal grill). Add asparagus with salmon on the grill and cook covered for about 10 minutes (five minutes on each side, depending on thickness of salmon.) For best results, do not cook past medium. In a medium-sized mixing bowl, add sour cream, dill, paprika, salt and pepper and juice from 1/2 lemon and mix thoroughly. After salmon and asparagus have been removed from the grill and cooled slightly, pour lemon-dill sauce over salmon as well as over asparagus if desired, and garnish with fresh lemon and dill sprigs.